While petty urban dwellers battle against nosy neighbours with water guns and powder bombs, the more refined make a temporary escape to Singapore’s tranquil spots for a much deserved retreat. Win your little battles with today’s Groupon to Days Hotel at Zhongshan Park. For $168, you get a 2D1N City View Room Stay with Buffet Breakfast (worth $353). 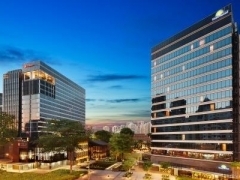 Ever since opening its doors in December 2012, Days Hotel Singapore at Zhongshan Park has offered travelers hailing from Asia and beyond the experience of a lifetime, and that is before guests have even set foot beyond its pristine lobby. Ditch worries of completing the day’s household chores and come take advantage of an array of modern facilities, including an all-day dining restaurant where guests can feast on authentic and mouth-watering cuisine, or a 24-hr gym where Johnny Bravo hopefuls can work on those muscles. With City View rooms equipped with a 32-inch flat screen TV with cable channels, free Wi-Fi access, and an in-room safe deposit box, city dwellers need not worry about the horror of being stuck in a forgotten part of the world; instead, they will find themselves pampered from head to toe with the perks of civilization a mere stone’s throw away. Deal holders are entitled to a picturesque view of the Singapore city from the comfort of their rooms, so don’t forget to whip out your camera for that Instagram-worthy sunset, or simply imagine yourself as a mysterious tourist from the Land of Faraway. With complimentary shuttle services to and from Novena MRT, you’ll wonder why you never considered a staycation before. Being situated within Novena means that Days Hotel Singapore is a stone’s throw away from the heart of Singapore’s shopping district, so guests need not worry about jostling for space on the public transport as they journey to the mecca of bargains, dining experiences and more for the duration of their stay. With the Balestier Heritage Trail nearby, guests can embark on a trip down memory lane as they uncover Singapore’s lesser known cultural gems and historical landmarks, such as the iconic Art Deco Shophouses, Sun Yat Sen Nanyang Memorial Hall and more. Back at Days Hotel Singapore, guests will find themselves transported to the sun-soaked Mediterranean region, as the delectable offerings at 21 on Rajah will have even the fussiest of gourmets begging for more. Free Wifi in room is a tremendous plus point for it. Hotel was efficient and fast. Duty Manager was courteous and friendly. Saw how caring he was as well in providing towels to a child whose head was wet. Shuttle is a Very Good idea."